Pantera was an American heavy metal band from Arlington, Texas. The group was formed in 1981 by the Abbott brothers – drummer Vinnie Paul and guitarist Dimebag Darrell – along with vocalist Terry Glaze. Bassist Rex Brown joined the band the following year, replacing the original unofficial bass guitarist Tommy D. Bradford. Having started as a glam metal band, Pantera released four albums during the 1980s. 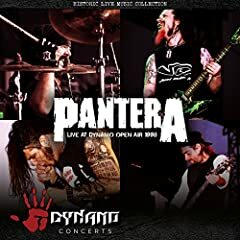 Looking for a new and heavier sound, Pantera replaced Glaze with Phil Anselmo in late 1986 and released Power Metal in 1988. With its fifth album, 1990's Cowboys from Hell, Pantera introduced a groove metal sound. I'm too lazy to point them out but I'm sure most agree. Apologies are unacceptable now. Left the "are" out. Not being rude. I also have the flu so don't use my fuckups against me? ?